Methodology Department of Primary Care and Public Health, Brighton and Sussex Medical School, Brighton. RCGP Clinical Champion in Perinatal Mental Health, Royal College of General Practitioners, London. Background Up to 20% of women experience anxiety and depression during the perinatal period. In the UK, management of perinatal mental health falls under the remit of GPs. Aim This review aimed at synthesising the available information from qualitative studies on GPs’ attitudes, recognition, and management of perinatal anxiety and depression. Design and setting Meta-synthesis of the available published qualitative evidence on GPs’ recognition and management of perinatal anxiety and depression. Method A systematic search was conducted on Embase, Medline, PsycInfo, Pubmed, Scopus, and Web of Science, and grey literature was searched using Google, Google Scholar, and British Library EThOS. Papers and reports were eligible for inclusion if they reported qualitatively on GPs’ diagnosis or treatment of perinatal anxiety or depression. The synthesis was constructed using meta-ethnography. Results Five themes were established from five eligible papers: labels: diagnosing depression; clinical judgement versus guidelines; care and management; use of medication; and isolation: the role of other professionals. GPs considered perinatal depression to be a psychosocial phenomenon, and were reluctant to label disorders and medicalise distress. GPs relied on their own clinical judgement more than guidelines. They reported helping patients make informed choices about treatment, and inviting them back regularly for GP visits. GPs sometimes felt isolated when dealing with perinatal mental health issues. Conclusion GPs often do not have timely access to appropriate psychological therapies and use several strategies to mitigate this shortfall. Training must focus on these issues and must be evaluated to consider whether this makes a difference to outcomes for patients. Following a review of quantitative observational studies in the same area,11 the aim of this review was to synthesise qualitative studies on GPs’ attitudes, decision making, and routine clinical practice for the diagnosis and treatment of perinatal depression and anxiety in primary care. Perinatal anxiety and depression is common in pregnant women and new mothers. In the UK, management of mild to moderate perinatal anxiety and depression falls under the GP’s remit but is potentially under-recognised. Qualitative studies were reviewed of GPs’ routine practice when seeing women with mild to moderate perinatal anxiety and depression. Research was sparse, but suggests that GPs consider perinatal depression to be a psychosocial phenomenon, and are frustrated at the lack of available therapy resources. A systematic search was conducted conforming to the PRISMA statement, between October and December 2014 on Embase, Medline, PsycInfo, Pubmed, Scopus, and Web of Science. Broad search terms were used to ensure as many articles as possible were identified (for example, general practitioner; family physician; anxiety; depression; *natal; *partum; pregnan*; matern*;). The grey literature was searched using the same search terms on Google, Google Scholar, and British Library EThOS. The systematic search returned 8210 papers (Figure 1). After removing duplicates and inspection of the title of each paper for relevance, 7524 papers were identified as not relevant for inclusion in this review. The abstracts of 686 papers were screened and 24 papers were scrutinised in full by two researchers. 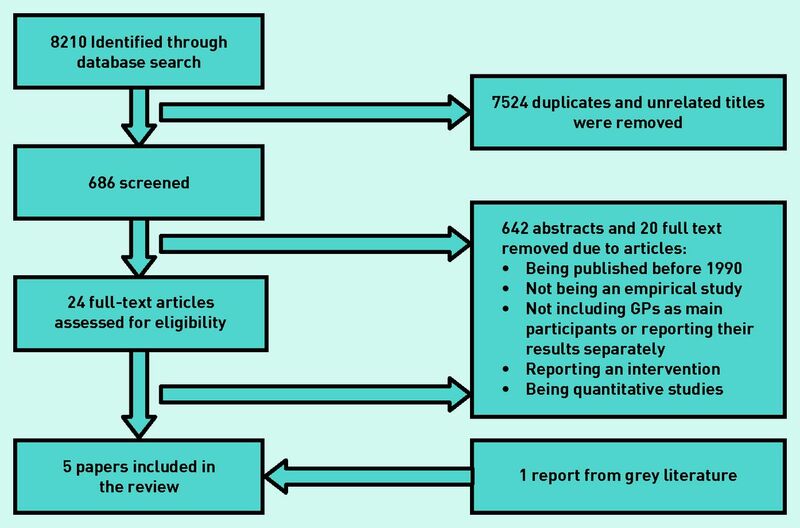 A further one eligible report was identified from the grey literature search. Papers and reports were eligible for inclusion if they reported qualitatively on GPs’ (UK, Australia, and Netherlands) or family physicians’ (FPs; US and Canada) attitudes, decision making, or routine clinical practice for the diagnosis or treatment of perinatal anxiety or depression in primary care. ‘Qualitative’ was defined very broadly to mean any results reported as text rather than numbers, and mixed-methods studies were included if they reported results analysed qualitatively. Papers were ineligible if they were published before 1990, did not report original research, were not published in English, GPs or FPs were not the main participants or reported as a separate group, or they reported interventions or quantitative results. At the full-text stage, studies were excluded if they were not an empirical study (n = 5), if they did not include GPs as the main participant (n = 4), if they were randomised controlled trials evaluating an intervention (n = 4), and/or if they reported on quantitative methods only (n = 9) (studies were excluded for more than one reason so N >19). One Brazilian paper20 was excluded because primary care in the Brazilian healthcare system was non-comparable with general practice as described in other papers. Out of 11 possible points, all studies scored 9 or 10. The checklist and results are available from the authors on request. The synthesis was constructed using the process of meta-ethnography described by Noblit and Hare.25 The papers were read and quotes identified by two researchers. They were then re-read and key themes were identified by one of those researchers. Tables were constructed for each paper showing first- and second-order constructs for each theme. The definitions of these constructs were taken from Malpass et al,23 where first-order constructs are considered to be participants’ ‘views, accounts and interpretations’, that is, direct quotes from participants. Second-order constructs are considered to be ‘authors’ views and interpretations … of patients’ views’, that is, analytic commentary on the first-order constructs. Using these tables, studies were then translated into one another using the processes of reciprocal and refutational translation.25 Quotes from participants were used to support the credibility of the new themes and to demonstrate their traceability back to the originals.26 To bring fresh insights and new understandings, a line of argument synthesis was carried out so that the translated themes were organised into a logical and coherent order.27 All authors read and agreed the thematic structure of results. Data on the structure of themes are available from the authors on request. isolation: the role of other professionals. Table 2 shows which themes were drawn from which studies. This meta-synthesis shows that GPs consider perinatal depression within the context of women’s lives and are frustrated at the lack of talking-therapy resources they have available. It is clear that GPs try to plug the gap in mental health services by inviting women back regularly, thus developing a potentially therapeutic trusting relationship. Much more research is needed in this area, and particularly in how GPs manage perinatal anxiety, to inform training and resource interventions. Where interventions are implemented, they must be evaluated to consider whether they make a difference to outcomes for women. The present search strategy was comprehensive so it is likely all available literature was captured, and the methodology for synthesising the papers was robust. Only one researcher screened titles and abstracts, however, which may have made study selection unreliable. The small number of studies and small samples mean that these findings represent only a narrow range of views, are not generalisable, and are likely to be subject to selection bias. Additionally, because of the small range of literature available, a lower-quality study was included, which used open-ended survey responses and a non-peer-reviewed report. The survey study was focused on prescribing for breastfeeding women rather than perinatal mental health, thus results from this study could only support rather than initiate themes. Additionally, no evidence was found for how perinatal anxiety is recognised or managed in primary care. Studies all originated from English-speaking countries (UK and Australia) and, given that four of the five were UK based, these results are very UK focused. Much more research is needed in this area to confirm these findings and set them in context, and explore how GPs manage perinatal mental health in other countries. This meta-synthesis has highlighted that GPs consider perinatal depression a psychosocial phenomenon rather than a biomedical one, leading to a reluctance to label disorders and medicalise distress. This finding is congruent with other commentaries on recognition and management of depression in UK general practice.34 Practitioners vary considerably in the threshold at which they will label patients as cases needing treatments because depressive symptoms are widely distributed through the population and change quickly.35 GPs see a range of social problems leading to distress and sadness, so doubt the effectiveness of antidepressants35 and doubt that patients’ problems are solvable with medical treatment.36 This can lead them to approach disclosures of mental health symptoms with reassurance, or a ‘watch and wait’ approach. Women may perceive this response as their symptoms being minimised and dismissed,37–39 after which they may become reluctant to pursue treatment.40 ‘Watch and wait’ is also potentially an inappropriate strategy in the perinatal period when suicide is a real risk41 and disorders may have profound impacts on the child’s emotional and behavioural development.7 Some evidence suggests that, when trusting relationships with healthcare professionals have time to develop, the risk of dismissing new or important symptoms is diminished.42 It could be argued that, rather than offering lesser treatments for perinatal women with anxiety or depression, GPs should be more proactive about initiating treatment during this vulnerable period, compared with at other times in a woman’s life. GPs reported on helping their patients to make informed choices about treatment, and on attempting to plug the gap in availability of ‘talking’ therapies by inviting women to come back regularly for GP visits. They prescribed antidepressants despite recognition that a psychological therapy may be more appropriate. This suggests a tension between what GPs consider to be best practice and what they can practicably offer. Studies suggest GPs are aware of patients’ dislike and reluctance to take antidepressants,35,46 and would prefer to offer patients treatments aligned with their preferences. The final theme suggests that GPs feel isolated when dealing with perinatal mental health issues. Over recent years midwives’ and especially health visitors’ methods of working have moved from case loading and affiliation to a particular GP surgery, to corporate team working, where it is harder for professional relationships to develop. This may have reduced collaboration between different specialties, and may risk women losing out on joined-up care. For example, Chew-Graham et al 28 reported health visitors as having negative attitudes to GPs, and as saying that GPs do not have a ‘sympathetic attitude’ and would ‘just write a prescription’. Given that health visiting services are now commissioned by the local authority rather than the NHS, the coordination and continuity of care are becoming harder rather than easier within the primary care and community environment. Research with GPs on how they manage perinatal depression is currently sparse, and none was found exploring perinatal anxiety or PTSD. Future research is needed at all levels of the primary care pathway, from recognition of psychological distress, to outcomes of treatment both within primary care and following referral to specialist services.47 Training and resource interventions should be evaluated to see if they improve outcomes for women, their infants, and their families. Continuity of care and trusting relationships are found to be important in the literature on women’s perception of help seeking. It is unlikely, however, that GPs will have more routine antenatal contact with pregnant women to develop a sense of continuity,48 or closer working relationships with midwives and health visitors in the near future. One potential strategy is for practices to have a GP lead for maternity and maternal mental health who regularly meets with local midwives and health visitors, coordinates strategy within the practice, and is visibly available for patients to consult with about perinatal mental health issues. A key issue for GPs is also to have specialist community perinatal mental health services available to refer patients to in a timely way. Very recently, there has been considerable investment in specialist perinatal mental health by the current UK government, for example, development of Mother and Baby Units and specialist community teams, but little so far to address the common mental health problems that are usually managed in primary care. The authors gratefully acknowledge the help of Maithreyee Vipulananthan and Fatin Elias in conducting the literature searches. None required for this paper as it is a literature review. Revision requested January 19, 2017. (2005) Perinatal depression: a systematic review of prevalence and incidence. Obstet Gynecol 106(5, Part 1):1071–1083. (1996) Rates and risk of postpartum depression — a meta-analysis. Int Rev Psychiatry 8(1):37–54. (2009) Postpartum obsessive-compulsive disorder: prevalence and clinical characteristics. Compr Psychiatry 50(6):503–509. (2006) Anxiety disorders during pregnancy and the postpartum period: a systematic review. J Clin Psychiatry 67(8):1285–1298. (2014) Prevalence and risk factors of postpartum posttraumatic stress disorder: a meta-analysis. Clin Psychol Rev 34(5):389–401. (2014) Postpartum anxiety and comorbid depression in a population-based sample of women. J Womens Health (Larchmt) 23(2):120–128. (2014) Effects of perinatal mental disorders on the fetus and child. Lancet 384(9956):1800–1819. (2014) The costs of perinatal mental health problems, https://www.centreformentalhealth.org.uk/costs-of-perinatal-mh-problems (accessed 15 May 2017). (2014) Antenatal and postnatal mental health: clinical management and service guidance. CG192. (NICE, London) https://www.nice.org.uk/guidance/cg192 (accessed 15 May 2017). (2015) Should perinatal mental health be everyone’s business? Prim Health Care Res Dev 16(4):323–325. (2017) Recognition and management of perinatal depression and anxiety by general practitioners: a systematic review. Fam Pract 34(1):1119. (2010) Postnatal women’s experiences of management of depressive symptoms: a qualitative study. Br J Gen Pract, DOI: https://doi.org/10.3399/bjgp10X532611. (2017) Maternal mental health — women’s voices. (Royal College of Obstetricians and Gynaecologists, London). (2006) How do women with postnatal depression experience listening visits in primary care? A qualitative interview study. J Reprod Infant Psychol 24(2):149–162. (2008) Women’s care-seeking experiences after referral for postpartum depression. Qual Health Res 18(9):1161–1173. (2008) Women’s views and experiences of antidepressants as a treatment for postnatal depression: a qualitative study. Fam Pract 25(6):450–455. (2004) Postnatal depression across countries and cultures: a qualitative study. Br J Psychiatry Suppl 46:s10–16. (2013) Perinatal mental health: experiences of women and health professionals, http://www.bftalliance.co.uk/the-report/ (accessed 15 May 2017). (2013) Postpartum depression: the (in) experience of Brazilian primary healthcare professionals. J Adv Nurs 69(6):1248–1258. (2008) Conducting a meta-ethnography of qualitative literature: lessons learnt. BMC Med Res Methodol 8:21. (2013) Men’s experiences of antenatal screening: a metasynthesis of the qualitative research. Int J Nurs Stud 50(1):121–133. (1997) Focus on qualitative methods. Qualitative metasynthesis: issues and techniques. Res Nurs Health 20:365–372. (1988) Meta-ethnography: synthesizing qualitative studies (SAGE Publications Inc, Newbury Park, CA). (1996) Meta-synthesis of qualitative findings. Qual Health Res 6(4):553–560. (2005) Meta-synthesis method for qualitative research: a literature review. J Adv Nurs 50(2):204–211. (2008) GPs’ and health visitors’ views on the diagnosis and management of postnatal depression: a qualitative study. Br J Gen Pract, DOI: https://doi.org/10.3399/bjgp08X277212. (2013) A qualitative study into how guidelines facilitate general practitioners to empower women to make decisions regarding antidepressant use in pregnancy. Int J Ment Health Promot 15(1):3–28. (2010) GPs’ decision-making when prescribing medicines for breastfeeding women: content analysis of a survey. BMC Res Notes 3:82. (2015) Falling through the gaps: perinatal mental health and general practice. (Centre for Mental Health, London). (1987) Detection of postnatal depression. Development of the 10-item Edinburgh Postnatal Depression Scale. Br J Psychiatry 150(6):782–786. (2004) Physicians’ constructions of depression: inside/outside the boundaries of medicalization. Health (London) 8(3):275–293. (2000) Why can’t GPs follow guidelines on depression? We must question the basis of the guidelines themselves. BMJ 320(7229):200–201. (2005) Women’s and doctors’ accounts of their experiences of depression in primary care: the influence of social and moral reasoning on patients’ and doctors’ decisions. Chronic Illn 1(1):61–71. (2003) Postpartum depression among African-American women. Issues Ment Health Nurs 24(3):297–316. (2004) Perinatal depression among black Caribbean women. Health Soc Care Community 12(5):430–438. (2014) Saving lives, improving mothers’ care — lessons learned to inform future maternity care from the UK and Ireland Confidential Enquiries into Maternal Deaths and Morbidity 2009–12 (National Perinatal Epidemiology Unit, University of Oxford, Oxford). (2015) Experience of care for mental health problems in the antenatal or postnatal period for women in the UK: a systematic review and meta-synthesis of qualitative research. Arch Womens Ment Health 18(6):745–759. (2008) Overconfidence as a cause of diagnostic error in medicine. Am J Med 121(5 Suppl):S2–S3. (1988) Dealing with uncertainty, risks, and tradeoffs in clinical decisions. A cognitive science approach. Ann Intern Med 108(3):435–449. (2002) Reviewing intuitive decision-making and uncertainty: the implications for medical education. Med Educ 36(3):216–224. (1980) Mental illness in the community: the pathway to psychiatric care. (Tavistock Publications Ltd, London). (2016) Better births Improving outcomes in maternity services in England A five year forward view for maternity care, https://www.england.nhs.uk/wp-content/uploads/2016/02/national-maternity-review-report.pdf (accessed 15 May 2017).